X Son cœur brille des couleurs de l’arc-en-ciel. On raconte que c’est une pierre précieuse. X Su núcleo central brilla con los colores del arcoíris. Para algunos tiene el valor de una gema. X Nel suo nucleo brillano i sette colori dell’arcobaleno. Qualcuno lo considera una pietra preziosa. X 코어라고 불리는 중심 부분은 일곱 빛깔로 빛난다. 이것을 보석으로 삼는 사람도 있다고 한다. Y Un noyau rouge trône en son centre. Il envoie des signaux radio mystérieux vers le ciel nocturne. Y El centro de su cuerpo alberga un órgano que emite extrañas señales de radio en la noche. Y Al centro del corpo ha un nucleo rosso che diffonde misteriosi segnali radio nel cielo notturno. Y 몸의 중심에 있는 빨간 핵에서 밤하늘을 향해 알 수 없는 전파를 발신한다. 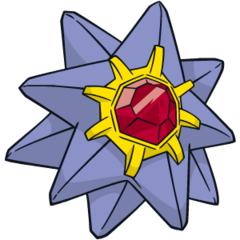 Omega Ruby Starmie swims through water by spinning its star-shaped body as if it were a propeller on a ship. The core at the center of this Pokémon’s body glows in seven colors. Omega Ruby Starmie kann schwimmen, indem es seinen sternförmigen Körper wie eine Schiffsschraube dreht. Der Kern in seiner Körpermitte leuchtet in sieben Farben. Omega Ruby Staross nage en faisant tournoyer son corps en forme d’étoile, un peu à la manière d’une hélice de bateau. Le cœur au centre du corps de ce Pokémon brille de sept couleurs. 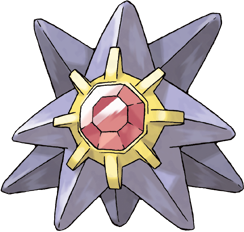 Omega Ruby Starmie nada por el agua haciendo girar su cuerpo estrellado a modo de hélice. El núcleo de este Pokémon brilla y llega a tornarse de siete colores. Omega Ruby Starmie nuota roteando vorticosamente il corpo a stella come fosse l’elica di una nave. Il suo nucleo brilla in sette diversi colori. Omega Ruby 별 모양인 몸을 스크루처럼 회전시켜 물속을 헤엄쳐 다닌다. 중앙에 있는 코어가 일곱 빛깔로 빛난다. Alpha Sapphire Starmies Mittelteil, sein Kern, leuchtet in sieben Farben. Aufgrund dieser Eigenschaft wird es auch „Juwel des Meeres“ genannt. Alpha Sapphire Le centre de Staross, son cœur, resplendit de sept différentes couleurs. Du fait de sa brillance naturelle, on appelle ce Pokémon le « joyau des mers ». Alpha Sapphire La parte central de Starmie, el núcleo brillante, resplandece con siete colores distintos. Debido a su naturaleza luminosa, a este Pokémon se le ha dado el apelativo de la Gema del Mar. Alpha Sapphire Il centro del corpo di Starmie, il suo nucleo, brilla in sette colori. Per la sua luminosità è chiamato “Gemma del mare”. Alpha Sapphire 몸의 중심에 있는 핵이라 불리는 부분이 일곱 빛깔로 빛나기에 바다의 보석이라는 별명이 붙었다. Sun Its shining core is thought to receive and transmit enigmatic signals. It has been known to cause headaches in those who approach it. Moon Its unusual body shape, reminiscent of abstract art, led local people to spread rumors that this Pokémon may be an invader from outer space. Red Its central core glows with the seven colors of the rainbow. Some people value the core as a gem. Blue Its central core glows with the seven colors of the rainbow. Some people value the core as a gem. Yellow The center section is named the core. People think it is communicating when it glows in 7 different colors. Stadium When away from human eyes, its core is said to glow mysteriously in seven colors. This Pokémon may have come from outer space. Gold The center section of its body is called the core. It glows in a different color each time it is seen. Silver Regardless of the environment it lives in, its body grows to form a symmetrical geometric shape. Stadium2 The center section of its body is called the core. It glows in a different color each time it is seen. Ruby Starmie's center section - the core - glows brightly in seven colors. Because of its luminous nature, this Pokemon has been given the nickname "the gem of the sea". Sapphire STARMIE swims through water by spinning its star-shaped body as if it were a propeller on a ship. The core at the center of this POKeMON's body glows in seven colors. Emerald People in ancient times imagined that STARMIE were transformed from the reflections of stars that twinkled on gentle waves at night. Pearl At the center of its body is a red core, which sends mysterious radio signals into the night sky. Platinum At the center of its body is a red core, which sends mysterious radio signals into the night sky. Black At the center of its body is a red core, which sends mysterious radio signals into the night sky. White At the center of its body is a red core, which sends mysterious radio signals into the night sky. White 2 Its core shines in many colors and sends radio signals into space to communicate with something.